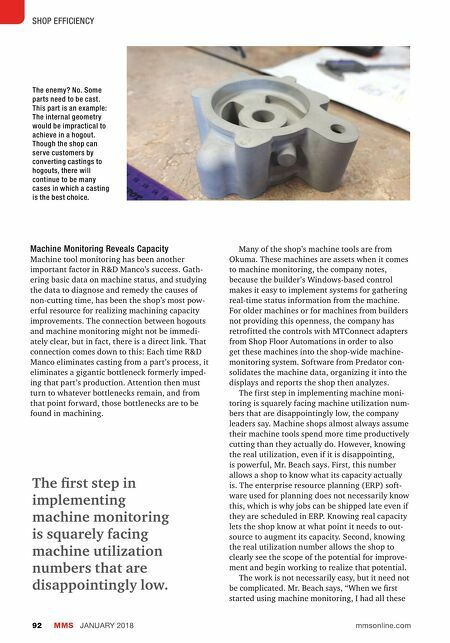 SHOP EFFICIENCY MMS JANUARY 2018 92 mmsonline.com Machine Monitoring Reveals Capacity Machine tool monitoring has been another important factor in R&D Manco's success. Gath- ering basic data on machine status, and studying the data to diagnose and remedy the causes of non-cutting time, has been the shop's most pow- erful resource for realizing machining capacity improvements. The connection between hogouts and machine monitoring might not be immedi- ately clear, but in fact, there is a direct link. That connection comes down to this: Each time R&D Manco eliminates casting from a part's process, it eliminates a gigantic bottleneck formerly imped- ing that part's production. Attention then must turn to whatever bottlenecks remain, and from that point forward, those bottlenecks are to be found in machining. The first step in implementing machine monitoring is squarely facing machine utilization numbers that are disappointingly low. Many of the shop's machine tools are from Okuma. These machines are assets when it comes to machine monitoring, the company notes, because the builder's Windows-based control makes it easy to implement systems for gathering real-time status information from the machine. For older machines or for machines from builders not providing this openness, the company has retrofitted the controls with MTConnect adapters from Shop Floor Automations in order to also get these machines into the shop-wide machine- monitoring system. Software from Predator con- solidates the machine data, organizing it into the displays and reports the shop then analyzes. The first step in implementing machine moni- toring is squarely facing machine utilization num- bers that are disappointingly low, the company leaders say. 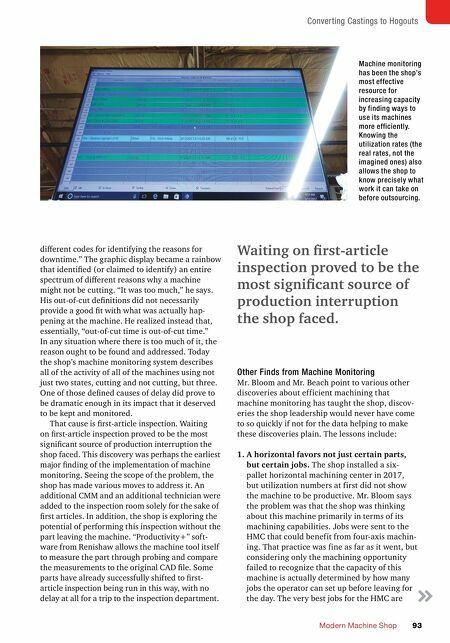 Machine shops almost always assume their machine tools spend more time productively cutting than they actually do. However, knowing the real utilization, even if it is disappointing, is powerful, Mr. Beach says. First, this number allows a shop to know what its capacity actually is. The enterprise resource planning (ERP) soft- ware used for planning does not necessarily know this, which is why jobs can be shipped late even if they are scheduled in ERP. Knowing real capacity lets the shop know at what point it needs to out- source to augment its capacity. Second, knowing the real utilization number allows the shop to clearly see the scope of the potential for improve- ment and begin working to realize that potential. The work is not necessarily easy, but it need not be complicated. Mr. Beach says, "When we first started using machine monitoring, I had all these The enemy? No. Some parts need to be cast. This part is an example: The internal geometry would be impractical to achieve in a hogout. Though the shop can serve customers by converting castings to hogouts, there will continue to be many cases in which a casting is the best choice.